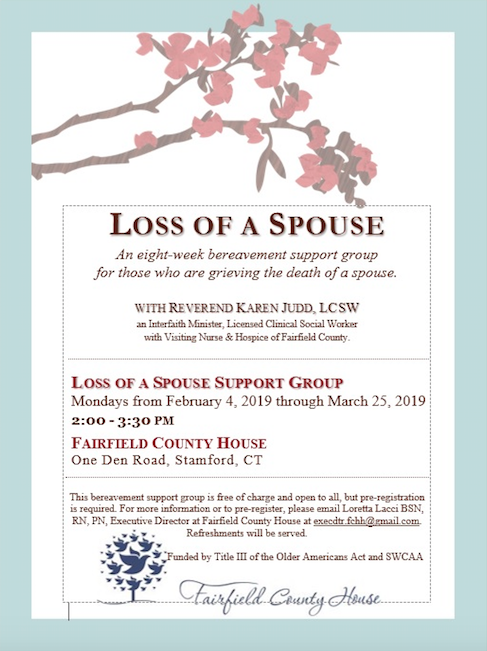 Fairfield County House in Stamford is sponsoring a series of eight bereavement support group sessions focusing on coping with the loss of a spouse. Sessions are free of charge, but pre-registration is required. The Loss of a Spouse Support Group meets from 2 to 3:30 p.m., Mondays, Feb. 4 through March 25, 2019 at Fairfield County House, 1 Den Road, Stamford. Refreshments will be served. Leading the group will be the Rev. Karen Judd, a licensed clinical social worker with Visiting Nurse and Hospice of Fairfield County and an interfaith minister. For more information and to pre-register, please email Loretta Lacci, executive director of Fairfield County House at execdtr.fchh@gmail.com. FCH offers a home away from home for those needing 24-hour care, dignity and privacy during their final days, weeks and months of life.